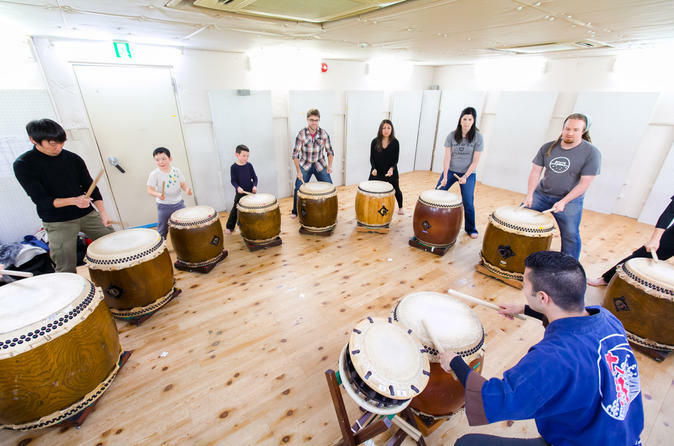 Try taking a traditional Japanese taiko drum lesson in Tokyo with a friendly, professional English-speaking instructor who will teach you how to play a Japanese traditional song with a Japanese drum. Taiko is a traditional, Japanese drum that has developed through the long history of Japan along with various traditional art forms such as Noh, Kyo-gen, Nagauta, and Kabuki. Wadaiko, especially, refers to a taiko of Japanese origin. It is a compound word consisting of "wa"(Japanese) and "daiko" (a suffix of the word "taiko"). With this experience, you will have a Taiko lesson led by a friendly, professional instructor who will teach you the basics. Of course there is no need to be good at speaking the Japanese language or know how to play any musical instruments. Students of all levels can enjoy this lesson. After taking the lesson, you, along with the other participants, will play a simple Japanese song together. At the end of the experience, the instructor let you wear a Happi, a traditional Japanese coat and take some pictures!